The Chief Hut is the main wooden building which combines the past and present. On the outside it resembles the huts of the Roman period, but inside guests are being transferred to different, modern world. This is provided by latest solutions and multimedia exhibitions. 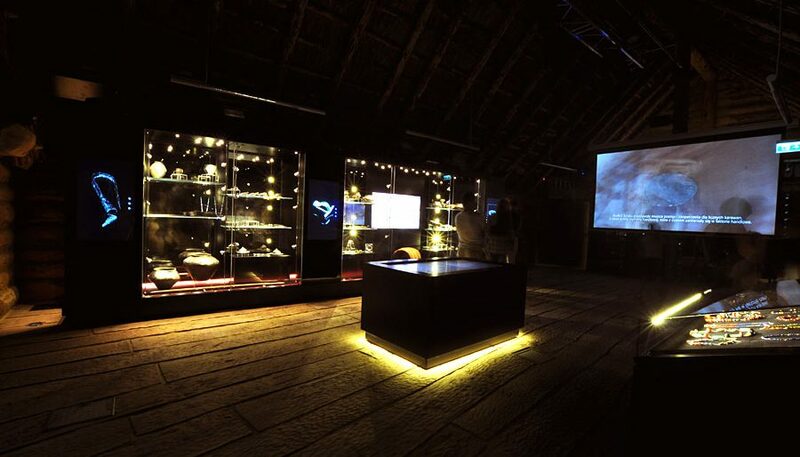 Thus, exhibits from the collections of the Archaeological Museum in Gdansk are presented in a very modern way. The theme of the exhibition is a display of the results of archaeological positions in Pruszcz Gdański and the immediate surroundings research. In particular, relicts from the Roman period, being the most prevalent in Pruszcz Gdański will be presented. Traditional signatures have been replaced by touchscreen panels showing rotating pictures, for the possibility of a thorough look at the monuments in the three-dimensional technique. In the central part there is a touchpad map, presenting archaeological sites from Pruszcz Gdański, from Neolithic to modern times. Also, you can watch the films showing prehistoric community life and the construction work on Faktoria.